Last week Bjarne Salén and myself went in to the Paron valley to continue our acclimatization on the mythical and indeed beautiful mountain Artesonraju, 6025m. 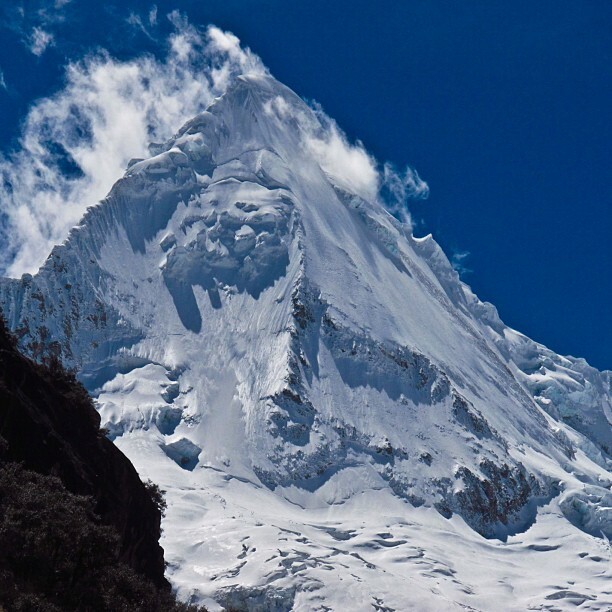 The mountain is widely known from the Paramount Pictures logo and for being one of the main objectives for climbers (and a few skiers) in the Peruvian Cordillera Blanca. I thought it would be a perfect second step in our acclimatization because it’s very straightforward and doesn’t have any major difficulties neither for climbing nor skiing. But it’s needed to be said again, it’s up there among the most beautiful mountains I have ever seen and I was really psyched to get the chance to ski it. After an easy hike up to moraine camp at 4800 meters we took one day of rest to really get the feel for the mountains and the conditions. At arrival the mountain looked pristine and perfect after a few days of wet snowfall. But on our rest day gusty storm winds were totally devastating for the ski conditions and plumes of snow were permanent on several places of the face. The result for my freeride dreams of the face was quiet obvious, but I always want to go up there and really give dreams a chance to unfold. You newer know, maybe there would be an untouched corner of the face where the snow would be at least consistent and grippy. We started at midnight that following day for the summit bid, skipping the high camps, but giving myself time to really walk slow if I would need to. I really down graded myself with the timing. In the middle of the night we reached the bergschrund and before six o’clock I was at 5700m, high up on the face and maybe 1-2hours from the top. When taking of above the bergschrund the feelings for the conditions were not good but I still reasoned I wanted to go as far as I could till I could see what the wind had done with our objective. Bjarne followed me up to the schrund, and waited there together with our newfound Ecuadorian guide friends who abandoned their try already there. 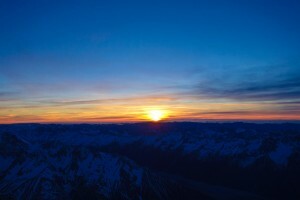 It was a beautiful sunrise, and it was a devastating view to see the face: perfect steep skiing powder destroyed by warm winds and then refrozen through the cold night. The result: ice topped sastrugi as far as the eye could see. This is a face that has been skied quiet a few times before. 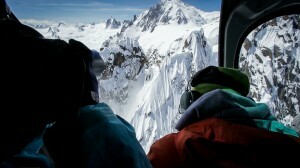 Ever since Patrick Vallencant did the first descent over thirty years ago people have come to ski this beauty. It’s arguable what skiing means, but I realized I could not do anything more than sideslip and hop turn this face at best. The dreams and steepness was set up on GS turns and smiles, not doing my best to kick in my edges in to the ice. I was surprised to get comments later, saying I was giving up to easily and that I should have finished the project no-matter-what. For me that’s totally ignoring the process of why I do things. And skiing, I think, needs a bit more of ideology and style than we have at this moment. It feels like we are where climbing was 30-40 years ago when getting up by any means possible was the only thing that mattered. Success was counted by reaching the summit, and the means, whether they included using oxygen, aid or drilling bolt ladders was forgot in the process. Now we are kind of in the same situation in mountain skiing as climbing was in back then. It’s all about just getting down things and no one usually ask how we did it. Any descent skier can technically get down any classical ski run. And that might be great for them, but no one usually asks how (style, technique, reading conditions, avoiding risk) and the mainstream focuses instead on what (the name of the run) we did. Of course, skiing the hardest and steepest things out there will never look pretty, but skiing classical lines by the high standards of the skiers of today – should, look amazing – if the timing of the right skiers are at the right place at the right time in the right conditions. It’s just a personal opinion, but I think the ethics of skiing need to catch up with those of climbing to preserve some of the esthetics mountain skiing really deserve to have. But behold: don’t be afraid of going out there and try! With trying comes defeats, but it’s the only way of reaching for our dreams! So this is all that went through my head on the higher slopes of Artesonraju, one of the most beautiful ski mountains I have ever seen. I knew I would reach the summit in an hour or two, but I also know I would only sideslip the upper 400 meters with an ice axe. 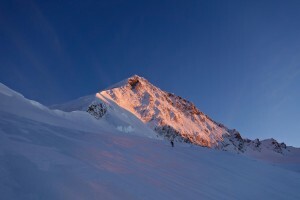 It would be a kind of mountaineering micro success, by reaching the summit and then get back down alive. Down climbing was, at least for my ability, a no-go with the soft unreliable sugar snow below the ice topped surface. It would have been a nightmare. But with skis on, it felt ok, but it was for sure not pretty. If I have a dream line in climbing that I really dreamt to do free, and if I was almost at the top before the crux pitches and it started raining. Then I wouldn’t try to go up there by any means. I would be there for the experience of climbing those pitches, not for getting to the summit. I would smile with the wind and rain in my face with equal joy and disappointment. I would just turn around and if the dream was strong enough, then I would come back one day. But I would definitely take a defeat for a defeat, knowing that it’s part of life and the only ingredient in life that creates the room for the sweetness of success. 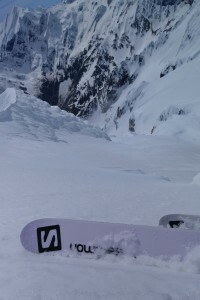 I made a platform, clicked in to my skis and effectively lost vertical meters quickly making a turn here, a turn there. Side slipped where I felt like I had to. 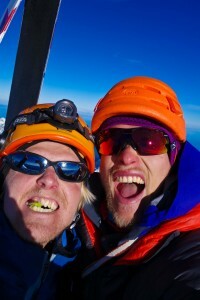 I got down to Bjarne, Estalin and Pablo – We high-fived and returned back down to camp. There was not much to be said. Everyone there knew the ways of the mountains and topics was already on the next one to be tried, the food, the drinks and the friends down in town.